Flags of member nations fly at United Nations Headquarters. The United Nations today called for restraint and calm in the former Yugoslav Republic of Macedonia following violence directed at democratic institutions and elected officials. “We are following developments unfolding in the former Yugoslav Republic of Macedonia with great concern and call for restraint and calm. Violence directed at democratic institutions and elected representatives of the people is unacceptable,” said a statement from the Spokesman for the Secretary-General. “We urge all political forces to resolve their differences through democratic means, strictly adhering to the Constitution, in order to overcome the political impasse without further delay,” the statement said. According to the UN Department of Political Affairs, it provides backstopping support and guidance to the personal envoy of the UN Secretary-General for talks aimed at resolving the name dispute between Greece and the former Yugoslav Republic of Macedonia. Negotiations on the name dispute began in 1993 and have been led since 1999 under the auspices of the envoy. While no solution has been reached so far, both parties have cooperated in the process and urged the continuation of the efforts of the Secretary-General and his envoy. 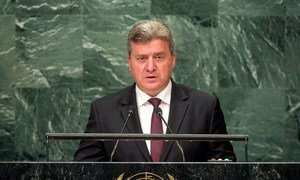 The world is at a crossroads of numerous crises, with the international community having entered a phase of fundamental changes in the global order and being faced with transformations that are both hard to stop and to control, the President of the former Yugoslav Republic of Macedonia, Gjorge Ivanov, told the United Nations General Assembly today.